"The minute that the Republican Party becomes the party - the anti-science party, we have a huge problem. We lose a whole lot of people who would otherwise allow us to win the election in 2012. When we take a position that isn't willing to embrace evolution, when we take a position that basically runs counter to what 98 of 100 climate scientists have said, what the National Academy of Sciences has said about what is causing climate change and man's contribution to it, I think we find ourselves on the wrong side of science, and, therefore, in a losing position." Obviously, the biggest deal here isn't that one party might find itself in a losing position -- it's crop failure for hundreds of millions of subsistence farmers and the destruction of large portions of coastal cities. But he makes the basic factual points that science supports the theory of evolution and global warming. I'm very glad to have somebody contesting the Republican nomination coming out and saying all these things. The usual thing people say is that with comments like this, he's not going to win the GOP nomination, and of course they're right. But especially after becoming Obama's ambassador to China, winning the nomination this time around was extremely unlikely. And there's still a way this could all work out very well for him. 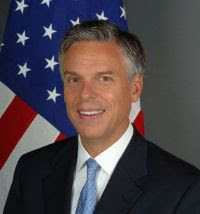 Huntsman is only 52 years old, and if the shape of American politics changes over the next decade or two, opportunities might open up. Maybe crazy people get the GOP nomination now and in 2016 and in all sorts of lower-level races, and they keep getting crushed, leading to the ascendancy of a sane GOP faction by 2020 or 2024. Or maybe Huntsman runs for the Democratic nomination as a candidate with crossover appeal, or gets Veeped up by some crafty Democratic nominee. As Ezra once noted, Obama's close enough to the sensible moderate Republicans of yesteryear anyway -- if we can accept him, why couldn't we accept the real thing? That's a pretty refreshing comment from Huntsman. It was interesting also to see him articulate his support of gay civil unions during the most recent debate. He was squirming about it, but at least stuck with his support (though without much conviction). Like you said, no shot this year, but maybe the future is bright. He has the hair and teeth for the job. ***I meant this election, not this year. I didn't know about the civil unions. Cool! I made the this election / this year mistake several times in drafting this post.